At least 100 people gathered at a banquet hall on a cloudy Saturday afternoon on Oct. 15 in Chicago’s Rogers Park to listen to a panel of speakers urge the audience to vote for Democratic presidential nominee Hillary Clinton. The event, held in the largely South Asian neighborhood along Devon Avenue near Rogers Park, was organized by the Chicago chapter of Muslims for Hillary, an ad-hoc group of American Muslims that has come together in a bid to help elect Clinton as the first female U.S. president. The U.S. census does not poll on religion so it is difficult to ascertain the exact number of Muslims in the country however, according to a Pew Research study this year, Muslims make up 2 percent of Chicago’s population. Samreen Khan and Salman Aftab, the main organizers of the event, assembled a wide array of prominent Muslim and non-Muslim speakers, including Bill Haddad who was the first Arab-American circuit judge in Cook County. Haddad, who resigned from the bench 10 years ago to practice law privately, told the crowd that the only way things would change was for Muslims to become active in their communities and get others involved too. Anthony Simpkins, who became the first Muslim judge to serve on Cook County circuit court in 2015, also encouraged the audience to vote so they could have their voices heard. He said the country’s changing demographics made it imperative that Muslims needed have a voice in politics. “Someone told me that if you’re not at the table, you’re on the menu,” Simpkins said to much laughter from the audience before adding that Muslims want the same things that everyone wants. The event also provided a platform for non-Muslim politicians. Congresswoman Jan Schakowsky and Cook County Commissioner Bridget Gaynor were on hand to talk about diversity in the country and the need to continue to honor the differences in race and religion. She also told the crowd that she had breakfast with parents of the slain army captain Humayun Khan Khizr and Ghazala, who spoke at the Democratic Convention earlier this year. She said she asked Khizr to sign her copy of the pocket Constitution so we can remember what this country is about. The crowd responded with loud cheers to this. Event organizer Aftab, a community activist and 2007 aldermanic candidate for the 50th Ward, which includes the parts of the Devon Avenue corridor, made a rousing call-and-response speech in which he urged the audience to combat the xenophobia, misogyny and Islamophobia that he said characterize the current presidential campaign with truth. He also quoted select passages from the Torah, Bible and Quran to show how each of the Abrahamic books show “we are all equal” whereas “Donald Trump divides on hierarchy of xenophobia,” he said. “[Trump] thinks Latinos are rapists, which is rich coming from a man who has history of assault, right?” Aftab said to loud applause. Alderman Ameya Pawar, of the 47th Ward, the first South Asian to hold this position in this ward of Chicago, spoke of his own discomfort when flying. “My wife asks why do I get dressed up when going to the airport, and I say it’s because I don’t want issues. Sometimes I get weird looks,” he said. The messages seemed to resonate with many of those in attendance. 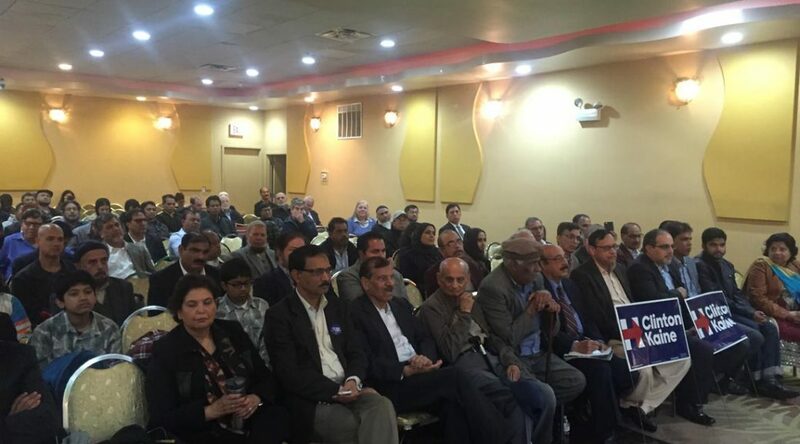 A few prominent Pakistani businessmen with strong ties to the Democratic Party and the Clinton family also spoke at the event. They noted that as First Lady Clinton started the tradition of marking Ramadan in the White House with an iftar (breaking of the fast), which has been continued since the Clintons left office. While Khan said she was pleased with the turnout at the event, she said the real challenge lay in getting people out to vote on Nov. 8. She said that she did not believe the Democratic Party’s stance on issues like marriage equality and abortion would repel the more conservative Muslims. “The main issue is whether that candidate supports Muslims on the whole and diversity,” Khan said.